Sadie is flat out obsessed with the My Little Pony show-she has all the characters in toy form (and some doubles), sleeps with them at night, acts out the plots of various episodes….and her favorite pony has always been Rainbow Dash. 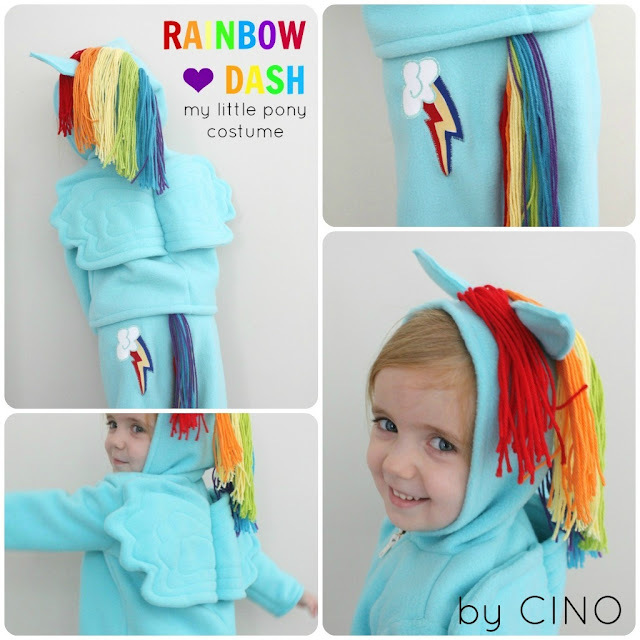 No wonder, I mean…she can fly and her mane and tail are the colors of the rainbow! So when I asked her what she wanted to be for Halloween this year there really was only one option in her little 4 year old mind. Find the full tutorial for the pants here and the hoodie here! I am really excited about how it turned out! I especially had fun collecting all the yarn colors-Michaels has the best colors vs Joann and was cheaper too…FYI. She’s gotta have her wings! I tried to get the yarn to flop over the front like in the cartoon, but Sadie wasn’t a fan of it in being in her face. I took pictures for a tutorial, so expect that up sometime soon! Update: here are the links! Next year when I’m not the size of a beluga whale I’ll get back to our family themed costumes! As long as the kids will agree…. SO cute! You did an awesome job & she looks do happy! Wow, I am so impressed! My girls also want to be ponies this year, but have you seen the horrible commercial costumes for pony loving children? Terrible. I also want to commend you on your attention to detail, not everyone would know dash’s mane is ROYGBIV, but her tail is VIBGYOR! Wow, amazing, fantastic costume. super! Wow this is super cute! Well done! Oh. My. Goodness! My daughter is going to wish she had you for a mommy when she sees this costume! It is adorable! It’s August! I’m impressed. By the costume and the timing. Great job. I went out and bought materials for a costume yesterday. Superheroes again…a bit of variety would be nice, but at least their easy! Sadie looks like she LOVES it. Great job Mama. Oh my goodness! 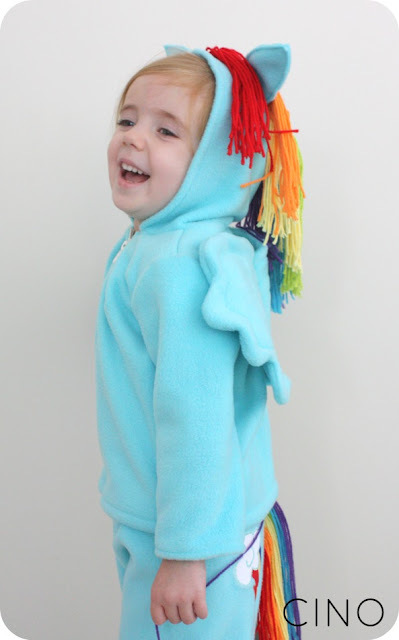 My three-year-old is a die hard Rainbow Dash fan. This is the cutest thing ever! I can’t wait to see Apple Jack. That is so darn cute, Jess! You are amazing. I am so impressed!!! She looks so happy. I showed this to my little girl and she went CRAZY for it! She’s now insisting that she wants this costume and she wants to dress her little sister up as Pinkie Pie! Awesome job! We can’t wait for the tutorial! i love it! You did a great job. If I were Sadie’s age, I would want to wear it morning and night. This costume would be a dream come true for my daughter! Can’t wait for the tutorial!!! You are the coolest. That’s a great rainbow dash costume and one very happy looking little girl! Oscar has requested a Transformers RescueBot costume. I have my work cut out for me. This is adorable! And it looks so cozy! She looks SO happy and this costume is just so darn cute!!! Way to go. 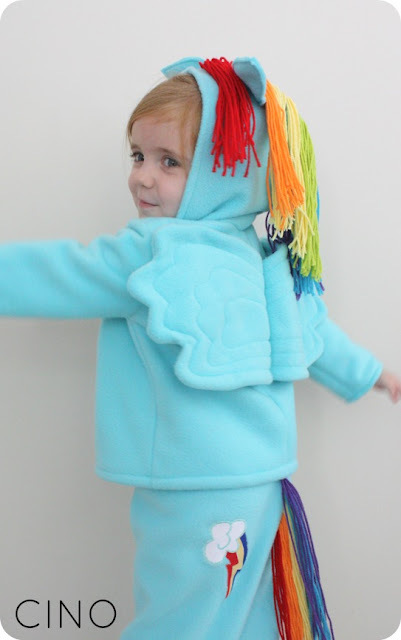 I think you could get a lot of traffic with adult sized my little pony outfits, lol. (jk, you’re right!) these mlp posts are getting me excited for girl toys! adorable and she looks so happy! This is so stinking’ cute!!! 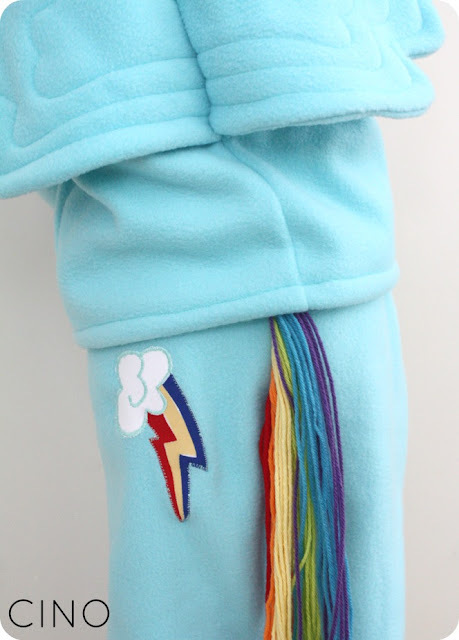 The cutie mark is awesome but I also love the stitching on the wings. Sadie looks so happy 🙂 Good job! SO cute, but were did you find the hoodie set? I’ve been looking everywhere and can’t find one! Thanks for your help. SERIOUSLY!?! This is awesome. I want to wear that for Halloween. OMG!! Rainbow Dash is my 5 yr old daughter’s favorite, too. She asked me for a costume and I didn’t have the prowess you do to figure it out. If you would be so kind as do a tutorial I would forever be in your debt. 🙂 I love it. You are AMAZING!! soooooooooooooooo cuuuuuute jess! 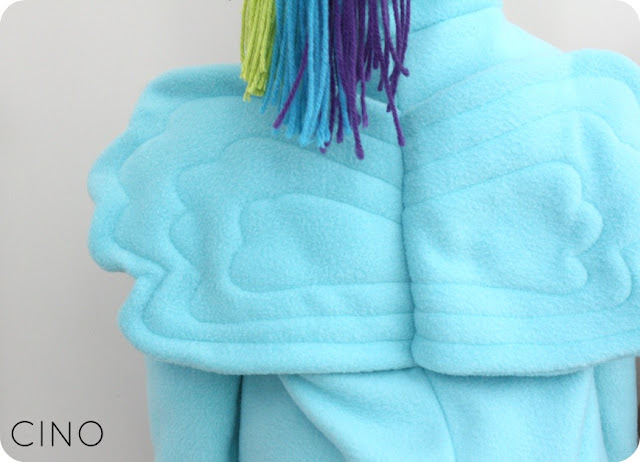 it’s the perfect trick or treating outfit for portland, too – it gets so chilly here you’ve pretty much gotta build fleece into the costume somehow! ha. love this though and love how excited sadie is to be wearing it! Love this!! I was just thinking about MLP or hello kitty for my 2 yo daughters costume. I adore your work!! You rock Jess. What a great mom you are. You are a life-saver! My daughter is turning four in a month, and she too LOVES LOVES LOVES Rainbow Dash. 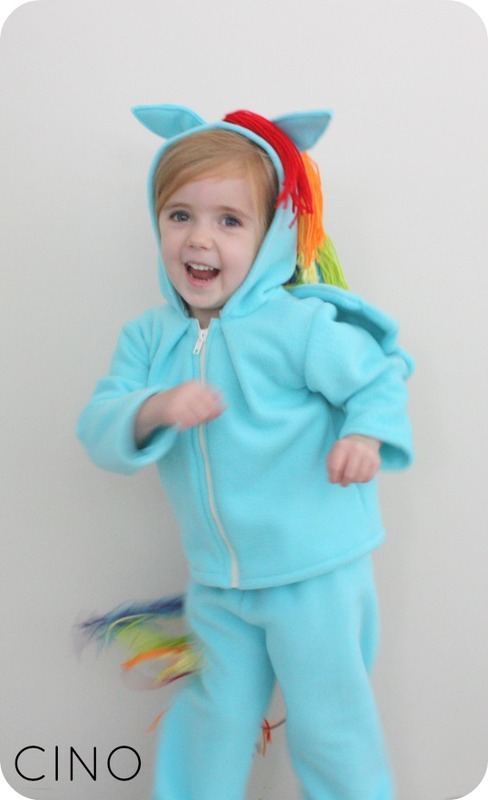 She informed me last night she wants to be Rainbow Dash for Halloween. I can’t wait for your tutorial!!!! My daughter is also obsessed with My Little Pony and just informed me that she wants to be Rainbow Dash for Halloween. I Googled and we BOTH fell in love with your costume! I can’t WAIT for the tutorial to make this for her. You’re awesome. Subscribing to your blog right now. I know another little one who would love this too. 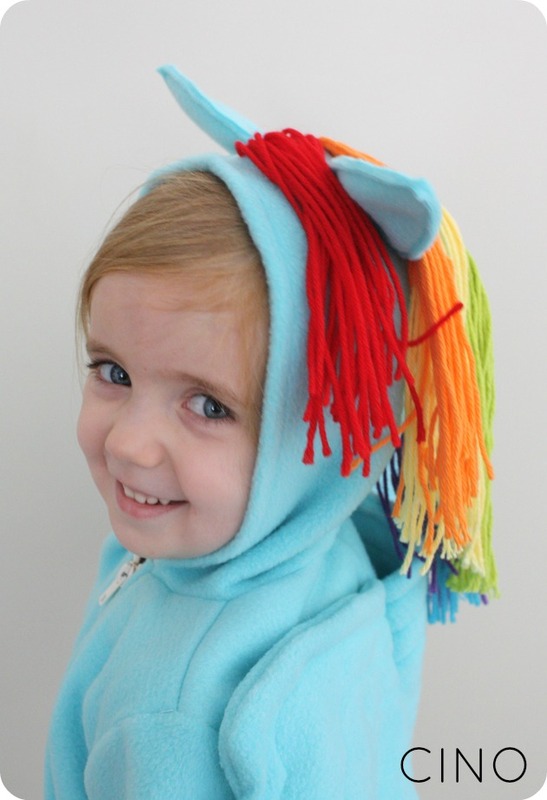 My 6 year-old just told me that she wants to be Rainbow Dash for Halloween, and this costume is so cute! The other costumes that came up in a Google search were awful. Do you think this would work in a size 7? I would definitely need instructions. I’m not crafy, but I can sew. Thanks for posting! Thank you so much for this idea! 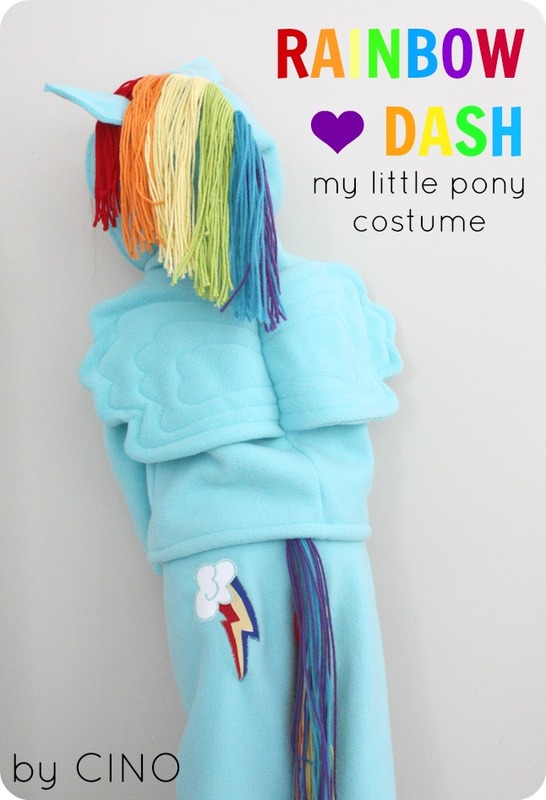 I too was very disappointed with the store bought costumes available for Rainbow Dash, but don’t have the creativity to think of this myself! I am wondering how you made the cutie mark. Great job! I have a 5 year old girl who can take or leave MLP, & a 3 year old brony. He’s the biggest fan in the house and can out trivia the girls on the block. Rainbow and Apple Jack are his favorites. Most likely due to their rough and tumble, take action personalities. Plus he used to think they were boys. Anyway, After seeing this I think he’d love a set of his own mlp dress-up clothes. The commercially available selection is pathetic. And there’s NO WAY it will hold up under an active boy or girl.